Prague Watchdog - Crisis in Chechnya - Chechnya's Strasbourg "anniversary"
On April 23, 2009 the European Court of Human Rights (ECHR) issued five new decisions on disappearances and killings in Chechnya in the cases of Alaudinova v. Russia, Bitiyeva and others v. Russia, Gakayev and Gakayeva v. Armenia, Israilova and others v. Russia, and Khachukayev v. Russia. 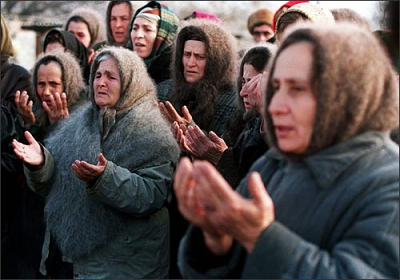 Any of one them could be – and is – the 100th “Chechen»” ruling by the European Court. Though not to the exact day, but nearly so, these 100 rulings coincide with the tenth anniversary of the recently “completed” “counterterrorist operation” (CTO). The CTO began in September 1999, and in the cases of Mezhidov v. Russia and Isayeva and Yusupova and Bazayeva v. Russia it was established that Russian military aircraft carried out the indiscriminate bombing of civilians fleeing Grozny in October 1999. The five most recent decisions were issued a week after the announcement of the ending of the CTO (over the space of ten years the counter-terrorist operation has shrunk to an abbreviation: throughout the long years of its existence, as far as I recall, the term has always been pronounced in full). As a matter of fact, these decisions relate to the events of 2002-03, while the most recent events since 2004, which Strasbourg is now considering – the “second five-year plan” of counter-terror – will be the subject of another hundred Chechen cases. In 99 of the cases already considered, at least one violation of the European Convention on Human Rights has been discovered, and in around 90 of the cases the Court has found that the Russian authorities were responsible for the disappearances, torture, extrajudicial killings and indiscriminate bombing. The total sum of damages and compensation awards determined by the Court is more difficult to calculate, but they are in the order of 5 million euros. The main problem lies elsewhere: only in one case have the persons found guilty of abducting the son of a complainant been identified and convicted – and then only after she had filed a complaint, so that the Court found that she was no longer a victim. In the other cases where the Court issued a ruling and admitted there had been a violation of the Convention, the perpetrators were not punished, even though the names of the suspects were known (to the public and / or the investigators). The European Court has not been able to eradicate impunity. So what has it been able to do? The principal area where those who planned the “mop-ups” and “targeted operations” have failed is in their aim of depersonalizing the victims and turning them into statistics. And the work of non-governmental organizations like Memorial and Russian Justice Initiative in reporting human rights violations in Chechnya and in filing the cases with the Strasbourg Court has made an enormous contribution to putting an individual human face on the woeful fates and the dehumanization that have been suffered by the victims of the violence. What lies ahead is an enormous task. It does not merely involve the bringing to justice of the perpetrators of the violations: the experience of conflicts in Latin America, Africa and many other places in the world (East Timor, Cambodia ...) has shown that such things happen only after a change of political regime or ruling group. Even more important is the search for the graves, and the identification of human remains: this will permit us to learn much more about the techniques used in enforced disappearances and about the methods employed by the “death squads” than we know at present. In south-east Turkey this spring, excavations begin on the site of the Kurdistan conflict, where the practice of forced disappearance has been widespread..
Of course, no court decision and no compensation award can bring back a relative who was killed, nor can they even suggest where his body might be found. But if they help the surviving members of his family even just a little, they represent a good deed. The arithmetic is simple: the 100 rulings by the Strasbourg Court are equal to 100 indisputably good deeds.